This Independence Day, the air will be filled with the smell of hot dogs and hamburgers sizzling on grills, blaring horns and crashing cymbals will accompany bands marching to the sounds of Sousa, and a dazzling array of fireworks will illuminate night skies nationwide as we come together to celebrate our most American holiday. 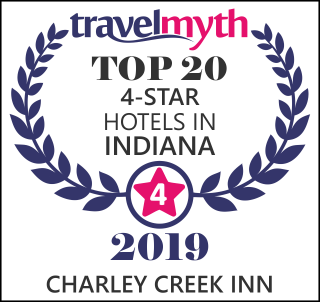 Guests of the Charley Creek Inn are invited to attend a local fireworks display, along with an exhibit of themed art at the Honeywell Center’s Clark Gallery. The Field of Dreams at Morrett Sports Complex will play host to this year’s July 4th fireworks. The show starts at 10:00 p.m. and will last one hour, wrapping up at 11:00 p.m. The Clark Gallery’s exhibit of themed art will be displayed through July 24th. This year’s theme is water, and all mediums were considered as long at the work reflected the theme. The winners of the competition include Chris Ziebarth’s “Sonder: The Long Walk to Water, Diana Williams’ “Island View,” and Gary Mohler’s “To the Last Drop.” The judge for the 2017 competition is Brandi Bowman, who received a B.F.A. from the Kendall College of Art and Design, and who has over 25 years of experience.